If you want to make the people in the checkout line at the store wonder if you've had a really bad day... get all the supplies for this one in one swoop. For me, this was combined with holiday baking and a butter sale... so in my cart was 12 packs of butter and 10 pounds of chocolate. It was awesome. Awesome enough that the couple in front of me had to keep taking turns glancing and whispering and trying not to be noticed. I finally simply said "My Girl Scout troop is doing the Quebec Chocolate Challenge and I make 30 tins of cookies for family and friends during the holidays. Butter is on sale." A collective "OOOOOOHHHHHH!!!!!" from the man, woman, and checkout girl. Ha! That was immediately followed with "Chocolate challenge? What is that? That sounds fun!!!" 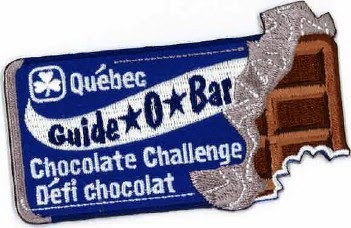 Yes... Quebec Chocolate Challenge... it is fun! Thanks to a dear Leader friend who told me about it. My girls were happy to participate without any arm twisting whatsoever. Imagine that! UPDATE 1/22/16: Okay.... so that link doesn't work, but they still have them. For our challenge... I made a S’mores Cheeseball for "snack". Not that we really needed it, but why not!? The meeting before the girls were instructed to bring their favorite chocolate recipe. Chocolate Recipe, which I would make into a book. Good thing their Leader knows they aren't the best at remembering Girl Scout "stuff" and padded the challenge with extra activities. Most of the girls forgot this. How you forget chocolate is beyond me. They also had to track their chocolate intake for a week. They did have this done. It was interesting to hear how some of them told parents they "had" to eat chocolate in order to have something to report. Ha! I sent an email to parents beforehand telling them about this challenge and assuring them this wasn't going to be every meeting, but we needed some FUN! We created a Chocolate Craft by dipping oreos and decorating them with sprinkles to take home! We gave some to the FACS teacher who graciously allowed us to use her room, too. She was thankful. One of the girl's Grandma came prepared with chocolate from Mexico and Switzerland. She talked to the girls about Chocolate Geography. I was shocked to hear what the girls knew. They learn about chocolate in school, apparently... How I missed that class, I'm not sure. If you want to freak out 6th grade girls, hand them a sheet of paper and a pudding cup and tell them to Be Daring. Make sure to tell them there are no brushes, spoons, etc. allowed... we are finger painting girls! They were not too sure about that one at first. We also played Kim’s Game. I cut a cross section off 10 different types of candy bars and the girls had to identify them. They worked as a group. The bars they answered correctly, they got a piece of to eat. The ones they didn't get right... they didn't get. They got 8 out of 10. Pretty good result, actually. Some of those candy bars are tricky and look similar. I think my favorite activity for the girls was the Chocolate Tester. They probably wouldn't agree. Ha! We had different types of chocolate (bitter, semi-sweet, sweet; milk, dark, white chocolate) for them to taste and identify. Their faces were priceless on the bitter and semi-sweet. By the time they got to the "good ones" they had a slight trust issue. HA!! But, it was all in fun and they had a great time. Don't think I'm torturing my troop or anything. 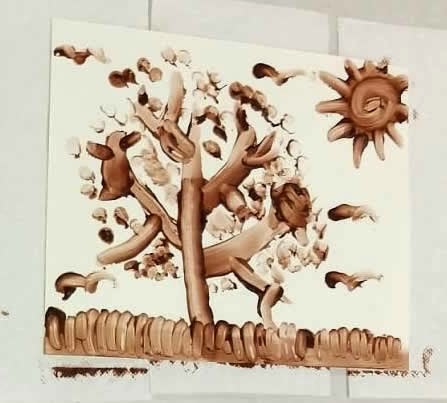 An interesting activity we did was the Chocolate Tree. They use the candy bars they identified by sight and put the wrappers in order based on by calories and fat grams and protein. They were shocked at the results. I won't ruin it for you, in case you use the same type of candy bars. It was an eye opener. By the time we got to the last 2 activities, the girls were hoping they didn't have to eat anymore chocolate (shocked, I know). We talked about a world in which we would use Chocolate as Money. I had them come up with a currency structure, rules, benefits, and consequences of money being M&Ms. They were very creative and decided that money we could eat probably wouldn't be a great idea. The last thing we did was create a few Chocolate Drama stories. I took this straight from the challenge. Have the girls create funny chocolate stories or skits. (1) The Day it Rained Chocolate (2) What will I do? I’m locked in a candy store (3) This is so weird! I took a bite of my _____ and …… (4) A giant chocolate bar came up to me and started crying saying….. (5) One morning, I woke up and had a bad case of chocolate fever/chocolate sniffles/chocolate pops. To say we had fun would be an understatement. This is a patch program. So, it isn't a badge and it shouldn't be on the front of your uniform. But, it's fun and highly recommend doing this with your troop if at all possible. This is definitely a memory maker and well worth the time and money. Oh... yes... word of caution... this is probably one of the most expensive meetings I had all year. The amount of chocolate needed to make it happen cost me about $40 for 7 girls. That's not a huge amount, but for a troop it can be. My recommendation is to have the girls bring in some of the supplies to help offset the cost.